When an artist completes a print at Crown Point Press they sign an OKTP, which literally means, “Okay to Print.” Each print in the edition is held to the standards of the OKTP. In order to get consistent results during editioning, we need to keep careful track of the inks that were used to make the OKTP. 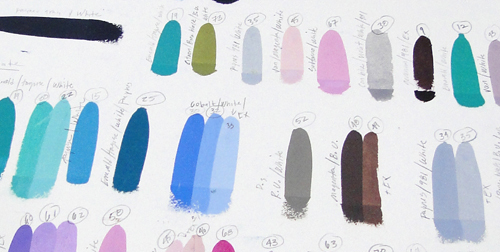 We use a system for managing the inks that includes keeping good notes as well as taking wet samples of each color. The first thing that we do is create what we call a “draw-down list,” which includes samples of all the colors that are used in the print as well as notes regarding plate order and any other important information. 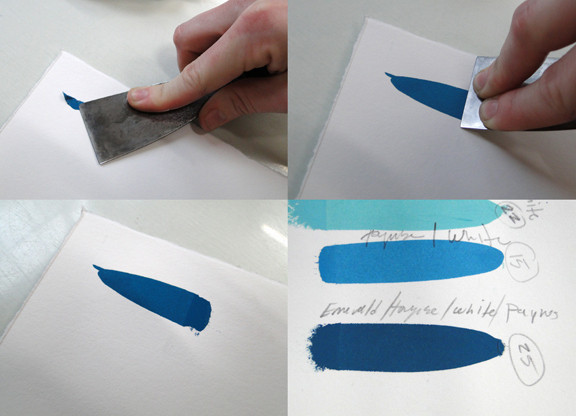 To make a draw-down, place a dab of ink on a small sheet of printing paper using a palette knife. Place your middle and index fingers on the edge of the knife and press firmly down as you pull the ink sample toward your body. List all the inks you used to make the ink mixture below the draw-down. It is helpful to list the dominant color in the mix first and rank the others in descending order. This will help you mix the color faster and with less waste when matching a new mix to your original sample. Also, write down any print details that you may need to remember, such as where the color is used in the print. In order to make sure we can replicate the colors within the print, we save wet samples of all the final ink mixtures used in the OKTP. These samples are kept in tinfoil packages. 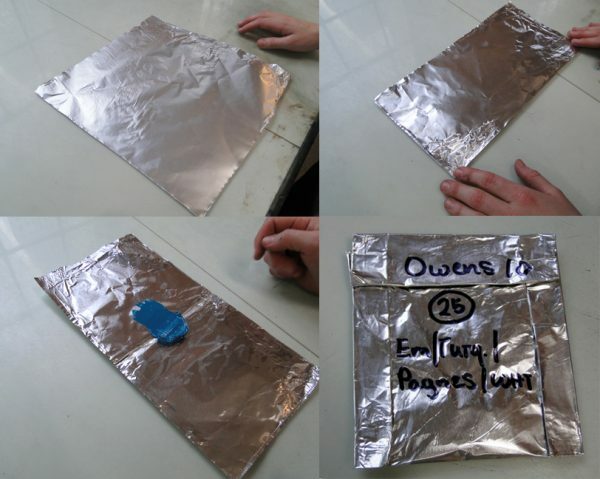 To make a package, tear off a small sheet of foil and fold it in half. Place your ink in the center of the foil sheet and then fold it in half. Next, fold over the three edges to close the package. It’s best to fold the sides twice so that the ink doesn’t seep or dry out. On the tinfoil package, write the colors in the mix in the same order that they appear on the draw-down. Be sure to also list any extender used in the ink sample. Once we are ready to start trial proofing the image, we make a bigger batch of ink. This batch should last through the entire editioning process. To decide on the best approach for mixing, check your color, and note the order of the various inks listed on the tinfoil package and on the draw-down. It is best to start by mixing small amounts of the secondary colors into the dominant color as it’s very easy to mistakenly add too much of one color and throw the pile off. For example, in my current mixing project, I put mostly emerald green onto the inking palate because that was the color that was used the most in making the final color mixture. Next I add turquoise, which is listed second on the ink pack, and then white. Once you think your mix is close to the final mix, make a draw-down comparison of the two ink batches side-by-side on a scrap of printmaking paper.Start by placing a small dab of the ink you want to match on the right. This is a helpful habit to get into, as you’ll always know which ink is the one that you are trying to match. Next, place a small dab of the ink mixture that you are currently mixing on left. Place these ink dabs close together so that in the draw-down the two ink samples touch, which will make comparing the colors much easier. Use a clean palette knife to draw down the two inks together. Be sure to use firm pressure so that you’re able to get an accurate color reading. Examine your draw-down and determine if your mix needs to be changed in order to match the OKTP ink. Continue this process until your new color matches the original color. When we begin printing with new ink mixtures we carefully check the colors in our first printed image against the OKTP to make sure they match. Even though the new mix may have looked good in the draw-down there are often nuances of color that come through in the printed image that you did not detect earlier. If this is the case, add the colors that are still needed to your new batch of ink and print the image again. You will want to continue this process of comparing the new print’s colors to the OKTP colors until all of the colors match the OKTP. We sell Charbonnel Black Ink #55981 in a can or a tube when available from the manufacturer.